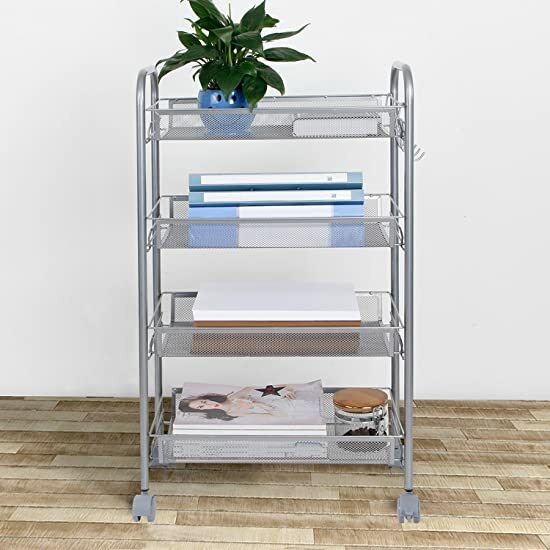 The Lifewit Movable Storage Rack is a multipurpose storage cart that can store your items in office, playrooms, kitchens, bathrooms, balconies, laundry rooms, and much more. Constructed with heavy duty carbon steel, the rack's maximum weight load is 88.1lbs. The polyester coating of the steel enables rust resistance for lasting use. 4 removable caster wheels allow for smooth movement. 2 of the caster wheels is equipped with braking mechanism to keep the cart in place when needed. Extra removable hooks to hang additional items. 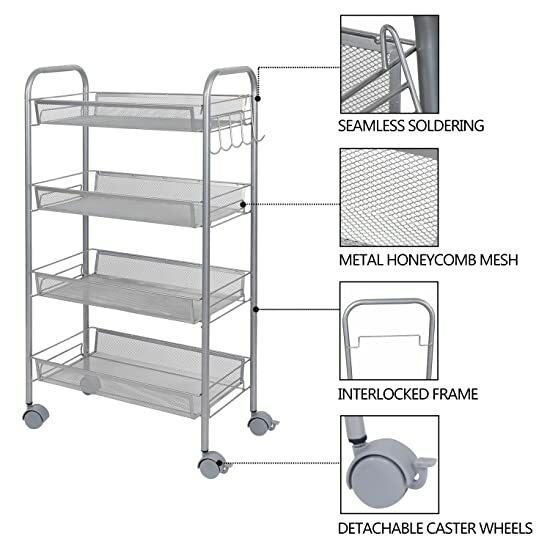 Unique design of the cart enables complete assembly without the use of crews or tools. 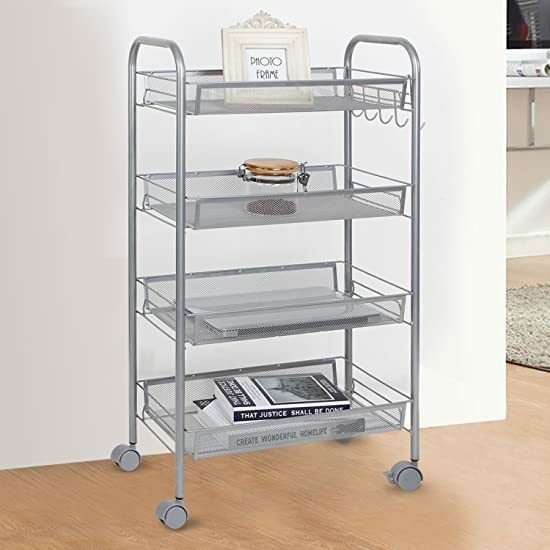 Side panel design of the steel mesh shelves secures items in place when the cart is on the move. 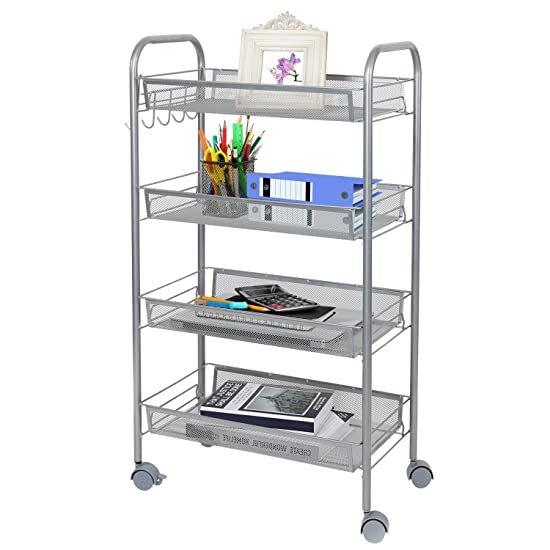 PREMIUM CONSTRUCTION: The Lifewit Movable Storage cart is constructed out of superior carbon steel for stability and durability. Eco-friendly and odorless polyester coating is applied to the steel to achieve rust-resistance. 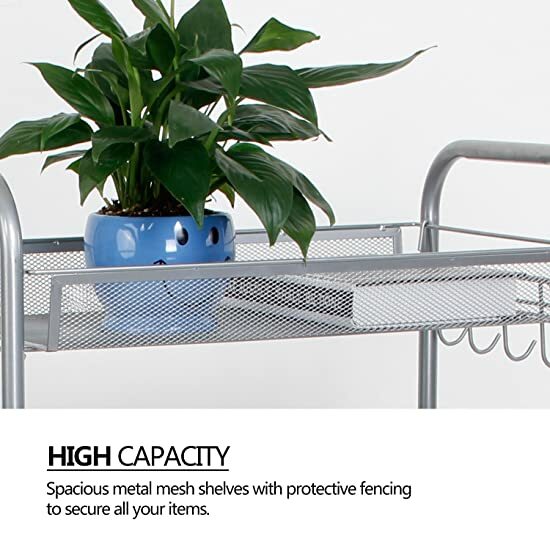 METAL MESH SHELVES: 4 plus-size honeycomb metal mesh shelves offer spacious storage capacity. 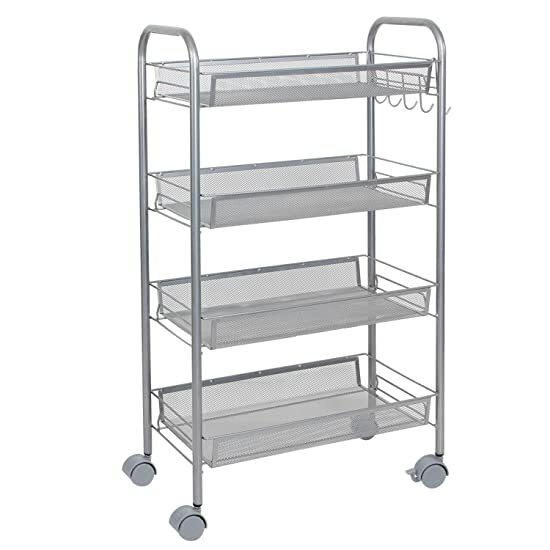 The fence panel design of the shelves secures stored items to prevent items from falling off when the cart is on the move. 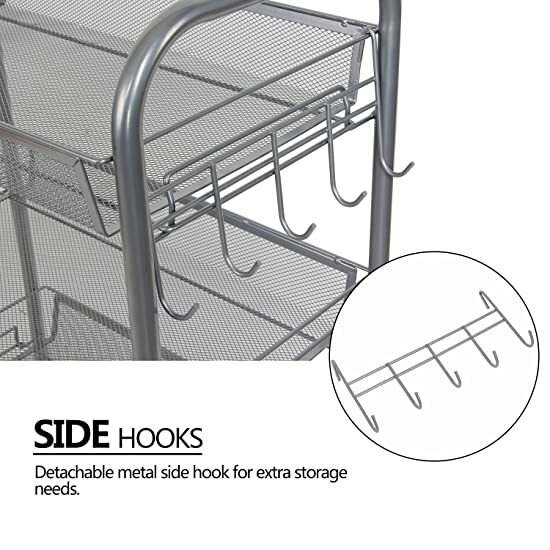 Detachable hooks are also implemented on the sides of the cart for extra storage needs. 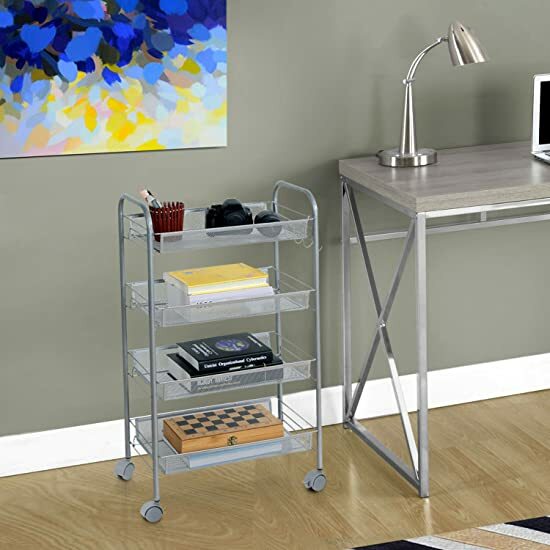 CASTERS: Equipped with 4 detachable casters for effortless movement. 2 of the casters are equipped with brakes to keep the rack in place. 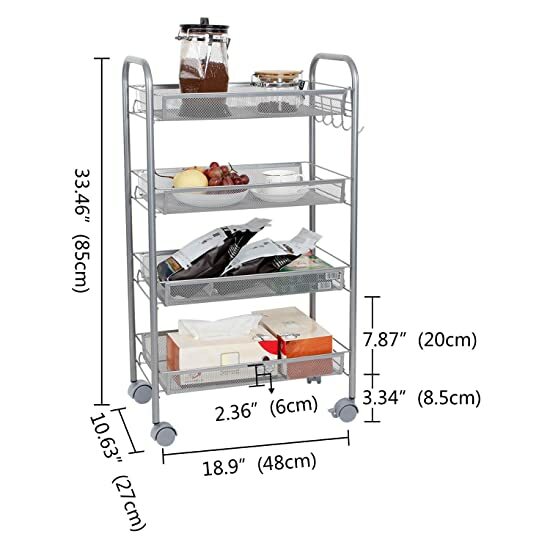 EASY ASSEMBLY: The intelligent design of the cart requires no tools or screws for effortless speedy assembly and disassembly. VERSATILITY: The Size is 85cm(H) x 48.cm(L) x 27cm(W). Max. Weight Capacity is 88.1lbs(40kg).Its contemporary design complements any decoration for kitchens, bathrooms, playrooms, balconies, laundry rooms, and much more.